This is my first attempt in making swiss roll. Alhamdulillah, with the guidance of mak lang's fotopages, finally i did it quite good, isn't it? Anyway, my thanks to Mak Lang Azie (ulampegaga.fotopages com) for the recipe and the guidance to make this lovely swiss roll. We like it very much. 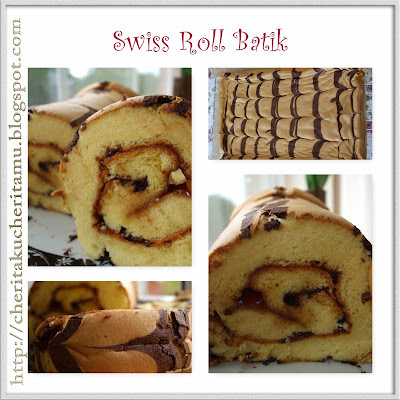 For you out there who would like to try, please click here Swiss Roll Batik by Mak Lang Azie.